The newest addition to the SYNLawn's plant-based, renewable product line includes a polyethylene product made from Brazilian sugar cane that is sustainably grown under some of the strictest environmental, social, and industrial practices in the world. The business and architecture community's response to these advancements has been astounding" said George Neagle, SYNLawn Vice President of Sales & Marketing. Yarn to yard, a phrase SYNLawn truly embodies as they advance their impressive 17 year lead in the Go Green charge. SYNLawn, well known for their ability to create and popularize breathtaking artificial grass product lines was the first in the industry to Go Green with their soy-based EnviroLoc™ backing; colored green to denote its plant-derived qualities this trademarked backing does more than help the environment. A three-layer system locks in fibers for less shedding and long-lasting durability under the toughest of environments. SYNLawn didn't stop there, the world’s long-standing powerhouse artificial grass manufacturer and consummate innovator created a one-roof manufacturing Facility. The first of its kind in American Artificial grass manufacturer brought all manufacturing elements under one-roof, including their famous soy-based backing. This more than $2 million dollar investment increases production capacity, speed to market and makes their Go Green products attainable for everyone's pocketbooks. The business and architecture community's response to these advancements has been astounding" said George Neagle, SYNLawn Vice President of Sales & Marketing. Neagle added, "We are excited to see renewable products contribute to our success and the record-breaking July 2017 production rates we saw. We are even more impressed by our customer's satisfaction and feedback on this expansive Go Green offering." SYNLawn is committed this long-standing 'Go Green' value with plans to expound on the sugar cane product category that is already, according to industry manufacturers, nine times as efficient to derive ethanol from than corn, and four-and-a-half times as efficient then deriving from sugar beets. Even more striking for the sugar cane product is this. Manufacturing one pound of petroleum-based polyethylene releases 5.5 lbs. of carbon dioxide to the atmosphere. That 5.5 lbs of greenhouse gas can actually be captured In an 18 month growing cycle by a field of sugar big enough to produce one pound of sugarcane-based polyethylene. SYNLawn is the unrivaled innovator in commercial, residential and golf synthetic grass landscape. 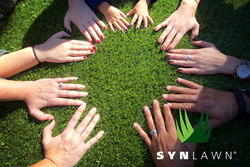 Boasting the only USDA-certified, bio-based artificial turf products in the industry, SYNLawn has created a first, 100% recyclable, lush, sustainable products that are superior in durability to petroleum-based products. SYNLawn’s unmatched level of vertical integration and quality control allow it to provide the best prices and strongest warranty on the market. These qualities along with its status as the largest manufacturer of artificial grass in the America are the reason retail giants like Lowes Menards insist on SYNLawn. SYNLawn also promotes the largest full-service distributor and installation network. With more than 75 locations, the vast SYNLawn footprint provides unmatched reach in artificial grass systems installation throughout the Americas and now Australia.